Crystal therapy is a form of healing that uses crystals or gemstones. 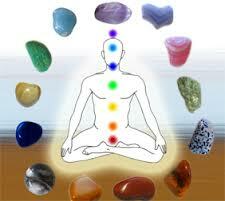 The crystals are mainly placed on specific areas of the body called "chakras". Chakra is a Hindu term that means 'spiritual energy'. According to this teaching there are seven basic energy centers in the body, each having a color associated with it. Some crystal healers place the same color crystals as the color of the chakra on the person to enhance the flow of energy. Crystals are said to direct the flow of energy to a particular part of the body and bring balance to a person's energy. Ultimately, they are used to cleanse the person from bad or negative energy believed to cause illness. Clearing out the bad spiritual energy alleviates the physical ailment. Crystals are used for physical, mental, emotional and spiritual healing. Not only do people visit "crystal healers", in some places, professional nurses are being trained to use crystals for their patients. Additionally, crystals can be worn, placed next to a person's bed as they sleep, and in some cases, placed around a person's bath. These services are available through personal meeting or can be discussed on the phone. No email queries will be handled for Crystal Therapy. Contact Here for an appointment.